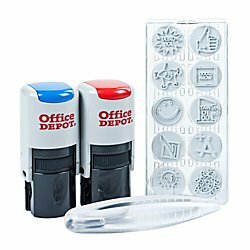 Perfect for teachers and at the office Kits contain 2 separate stamps and a variety of 10 interchangeable images. Self-inking teacher kit. Perfect for marking homework and tests! Kits contain 2 separate stamps and a variety of 10 interchangeable images.